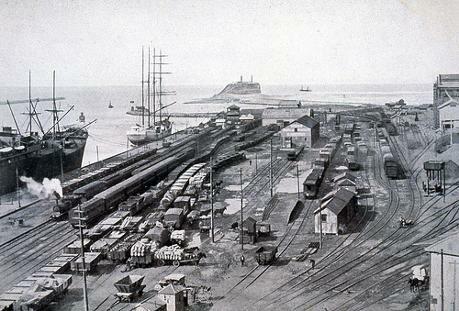 Railway Yards, Newcastle Port, . From the Dr John Turner Collection, University of Newcastle, Cultural Collections. Engineering and steel production have been important industries for Newcastle. As a port. Morison and Bearby Limited is Newcastle’s oldest established engineering firm. Founded in 1874 it manufactured marine engines, boilers and colliery equipment. It was taken over by Brambles in 1958. A Goninan and Co., started by Alfred Goninan in 1899, made pitheads and wagons for the coal industry. They had a subsidiary, Engineer and Colliery Supplies Co., and participated in the setting up of Commonwealth Steel for the production of railway wheels and axles. BHP Steelworks opened in June 1915. In 1923 BHP Collieries was formed. In 1928 the works consumed 18,000 tons of coal per week. This brought other companies to the area, such as Rylands Brothers (Australia) Ltd and John Lysaght (Australia) Pty Ltd. By the 1960s it employed 10,000 workers. The works closed down in 1999.